In need of relaxation and detox? Like all teas, this is bursting with antioxidants - the good guys that help keep us young and healthy. This light, floral and refreshing tea is perfect to unwind. 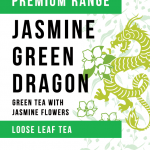 This Jasmine Green Dragon Tea is made up of jasmine buds layered with whole leaf green tea which entices the natural floral scent to absorb into the tea, giving it a delicate pure taste. Nature’s enchanting jasmine flowers are found in tropical regions, infused with green tea it becomes a magical elixir. This sensual haven is guaranteed to bring peace to your day.